And now for a family activity to partake in over the holidays that doesn’t include shopping, eating, or arguing: stacking cats. This new, larger version of the popular balance game features six cats who are just begging to be turned into a feline tower. 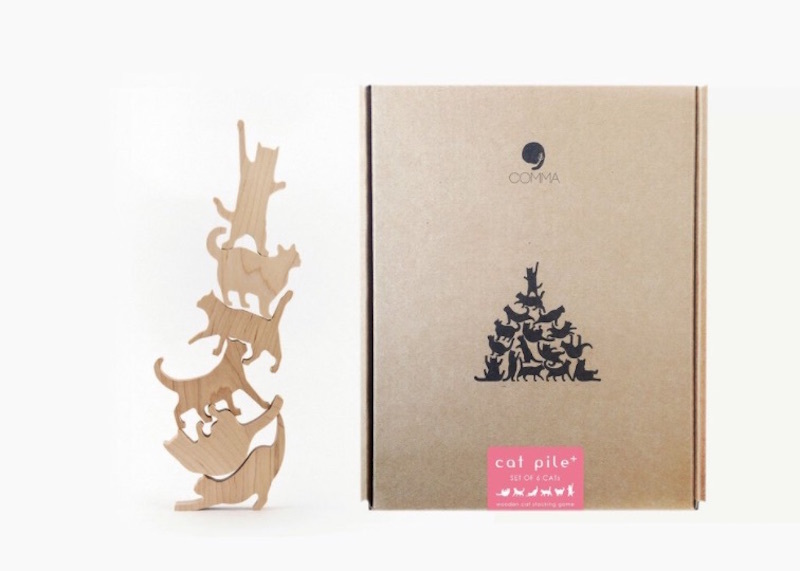 The kitties, which are laser cut, display the natural, unfussy beauty of maple wood. Each of the cats was designed to cover different cat attitudes (cattitudes?) and include cats at play and at rest as well as one who looks like he is either channeling the cover of Hamilton but may, in fact, just be stretching. Described as a “reverse Jenga,” this game will occupy kiddos and adults alike during the holiday activity lulls. If you buy multiple sets, cat stacking can become a group activity. Your real family cat may not always be cooperative when it comes to playing games (or doing anything other than following her own whims), so this will likely be the only time you will get away with moving or rearranging a cat’s position without getting a scratch in return. Little ones can also use the cat figures in this game as toys for imaginative play — including the unlikely scenario that your family will own six cats. And now for a family activity to partake in over the holidays that doesn't include shopping, eating, or arguing: stacking cats. This new, larger version of the popular balance game features six cats who are just begging to be turned into a feline tower. The kitties, which are laser cut, display the natural, unfussy beauty of maple wood. Each of the cats was designed to cover different cat attitudes (cattitudes?) and include cats at play and at rest as well as one who looks like he is either channeling the cover of Hamilton�but may, in fact, just be stretching. Described as a "reverse Jenga," this game will occupy kiddos and adults alike during the holiday activity lulls. If you buy multiple sets, cat stacking can become a group activity. Your real family cat may not always be cooperative when it comes to playing games (or doing anything other than following her own whims), so this will likely be the only time you will get away with moving or rearranging a cat's position�without getting a scratch in return. Little ones can also use�the cat figures in this game as toys for imaginative play -- including the unlikely scenario that your family will own six cats.